IS YOUR DOG GETTING OUT MORE THAN YOU? Whether your dog likes to run all day, play with the kids, or just relax in the grass, you can feel confident that he or she is safe in the yard thanks to DogWatch® Hidden Fence. The DogWatch® Hidden Fence System is the proven way to give your dog safety and the freedom he deserves. Keep him out of harm’s way – from chasing golf carts, bicycles or cars, not mention just roaming the neighborhood. Pet friendly and Vet friendly boundary training. Training your dog is what we do best. Following the principles of Ceasar Milan, “The Dog Whisperer”, we implement safe boundaries for your pet. With our lightest touch training method, your dog is sure to learn their boundaries quickly, safely and comfortably. We teach your dog to choose to stay within the boundaries. As certified dog trainers, we understand your dog's unique personality and breed. The smallest receiver in the world. At Dogwatch® we specialize in systems for small breeds like Yorkshire Terriers, Chihuahua, Maltese, Shih-Tzus, and all toy breeds. Our DogWatch® Hidden Fence System keeps an eye on your dog by transmitting a coded FM radio signal through a boundary wire installed around your yard at ground level or just below. This harmless signal is picked up by a lightweight waterproof receiver collar worn by your dog. Depending on the size of your property and the needs of your dog, signal range may vary from the boundary wire. We will adjust the range that is most suitable for your dog and yard. When your dog gets close to the boundary wire, an audible warning reminds your dog not to cross. If the warning is ignored – rare after training – the collar emits a mild stimulation. Lifetime Equipment Warranty – including dog chews! *We will recommend when your puppy is ready. Lifetime Warranty DogWatch® wants you to feel confident that your DogWatch® system is protected should your home experience an electrical surge due to lightning. That’s why we’ve gone to extremes, like no one else, to equip your DogWatch® Hidden Fence with both internal and external surge protection. This means you have ultimate protection from electrical surges that travel (1) into your house through other sources or (2) through the underground boundary wire in your yard. This unique two-way protection was developed and thoroughly tested by experts in the field of lightning expressly for DogWatch® products. We’re so confident that our lightning and surge protection is unsurpassed, that we provide a lifetime warranty with your transmitter when your system is properly installed and grounded by us. DogWatch® Hidden Fence cannot change Mother Nature or eliminate surges from hitting close to home, but we can help minimize the potential damage caused by surges to your DogWatch® Hidden Fence System. The DogWatch® Hidden Fence transmitter and power supply are each equipped with surge protectors to suppress surges coming in through your house wiring and divert them to your house ground. The DogWatch® external surge protector directs power surges and lightning from the boundary wire to the ground rod into the earth and away from your home. The DogWatch® power supply and surge protector are also UL –approved in the U.S. and Canada. There are no hidden costs when you purchase a DogWatch® Hidden Fence. 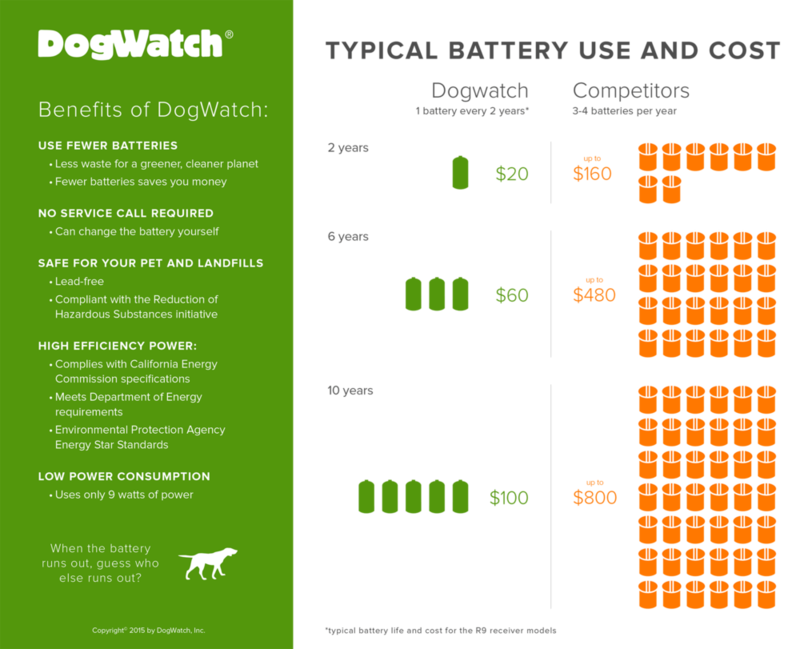 One DogWatch® battery in your R8 receiver lasts 2 years – the longest in the industry . Ask us for details. DogWatch® Hidden Fence Systems are also recognized as a Consumers Digest Best Buy. We proudly serve the following cities The Villages®, Lady Lake, Leesburg, Ocala, Gainesville, Spring Hill, Clermont, Orlando, Summerfield, Weirsdale, Brooksville, Wildwood, Oxford, Crystal River, Hernando, Inverness, Beverly Hills, Dunnellon, Citra, Williston, Hawthorne, Homosassa, Belleview and Ockalawah. SunSetter® Awnings are registered trademarks of SunSetter products Malden MA. DogWatch® should not be confused with Invisible Fence® or Invisible Fencing® which are products and registered trademarks of Invisible Fence®. THE VILLAGES® is a registered trademark of Holding Company of The Villages, Inc. Authority Home Solutions is not affiliated with, or sponsored by, Holding Company of The Villages, Inc. or its affiliated entities.